For six semesters in college, I was a weekly “opinion” columnist for the student newspaper. I made $10 a week off that sweet gig, which was usually enough to treat myself to one meal at Panera if I didn’t add a soft drink. (Unless I turned in my pay slips late, in which case I’d only get $8, which happened about 90% of the time). We all have skeletons in our closet. But I’m going to go out on a limb and guess that I’m one of only few who has ever had the same loaf of bread in my closet for seven years. I acquired it on St. Patrick’s Day of 1992. 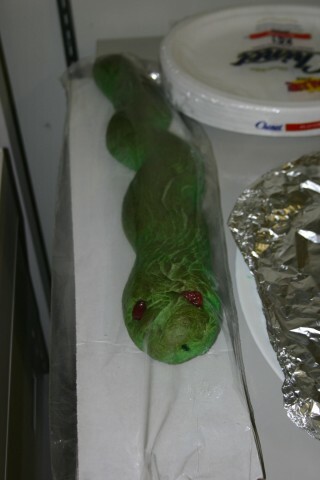 For a festive side dish, my mom brought home a loaf of bread that was dyed green, had eyes and was wound in the shape of a snake. At the time, I believed that anything that had a face also had feelings. I was mortified that Mom would expect us to sacrifice this snake as an offering to St. Patrick. When she left the room, I stole the snake bread and hid it in my bedroom closet. I found it seven years later. “Wasn’t it moldy?” you might ask. Well, I don’t know, because it was green to begin with. I thought I was over my phobia until my high school started serving circular tater tot disks with eyes and mouths cut into them to make them look like they were smiling. Normally, I am a fan of all things potato, but I got into the habit of disposing of these little demons before reaching my table. The one time I did attempt to eat them was completely unbearable. I couldn’t stand watching them be so obliviously happy when I knew where they would end up. I will eat slabs of cow by the fistful, dead or alive. But throw a couple eyes on a loaf of bread or punch a few holes in a potato, and I become a bleeding-heart animal rights activist. 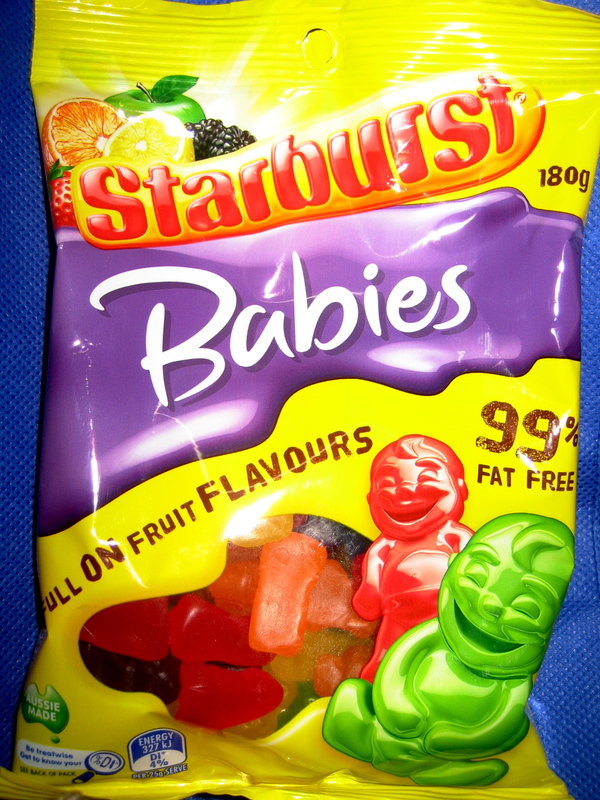 When I was studying in Australia, a popular snack was Starburst Gummy Squirts in the shape of human babies. Don’t get me wrong; they were delicious. With every bite, my mouth rejoiced in the delectable explosion of their sweet, flavorful infant blood. But that’s the problem: They ruined me. Now I can’t even look at children without salivating. I’ve had to abandon my dreams of motherhood. This past St. Patrick’s Day, a padded envelope arrived at my door addressed from my mom. Inside was a packaged loaf of green snake bread from our local grocery store. No card or anything. Mom was probably just trying to be funny, but I saw this as my opportunity to wrap up my unfinished business with green snake bread. (Photo yanked from Wine Lover’s Cooking Gallery). Oh my god. First of all, putting that online comment on before I read this was the best thing ever. I about died laughing. Second of all, I have the SAME weirdness! I also have a problem if you give something a name. I cannot eat a carrot if you’ve named it “Fred”, for example. An ex of mine used to use this to his advantage. Last piece of gum? Give it a face and legs. Last slice of pizza? Arrange the toppings like eyes. Seriously. I wouldn’t touch it. (Yes, I am a vegetarian.) Thanks for the memories and laughs! shrinksarentcheap basically said everything I wanted to. Can’t we get a “Like” button for our Word Press peeps’ comments?!!! I’ve been wishing there were a like button as well! So glad you enjoyed this, and so glad you can relate to my weirdness! That’s kind of hilarious what your ex used to do. My boyfriend sometimes uses it to torment me. Like when he totaled his car on vacation and we had to leave it behind in Montana. He would pretend to be the car, asking “You’re coming back, right guys? Guys…?” It killed me. Ha! Your college buds were very lucky to get to read “opinions” like this. I, too, LOVE the online comment. That makes your whole column and its $8-ish payday worthwhile. I am glad the snake is free. Thanks! I took my $8 and laughed all the way to the bank. When I saw the excerpt “I will eat slabs of cow by the fistful, dead or alive” come across my News Feed, I thought, “I know I have read that line before.” I was very pleased to see that it came from an IDS article you wrote! I have always thought that you are a very funny and talented writer. Humor writing is hard, and few people make it work. You manage to be consistently funny, and I hope that one day you have the very large audience you deserve. I am honored that you remembered my hunger for cow meat. Thanks so much, Chase. That really means a lot coming from you. You were my fav editor, hands down. Even if you did dock my $2. Do you mind if I quote a few of your posts as long as I provide criedt and sources back to your blog? My blog is in the exact same area of interest as yours and my visitors would certainly benefit from a lot of the information you provide here. Please let me know if this ok with you. Many thanks! Superior thinking desotmnrated above. Thanks! Hahaha, I love it. People can be awful. In a writing workshop I was in once, a girl wrote that she “felt like she was trapped in an episode of Lizzie McGuire that was lasting twenty hours too long.” She also told me to kill off all my characters. Oh- and that’s pretty awesome that you were editor of a travel magazine. I would really like that job. I have to think that that kind of nasty verbal stabbing is caused by a wee bit of jealousy and a severe case of insecurity. They say success is the best revenge. I say it’s also the best comeback. If you want that job, go get it. Look for the Society of Professional Journalists chapter nearest you. They can give you some leads. Not sure that I could eat green bread – I know it’s just food colouring, but eyes or not, it just looks wrong. It would be interesting to know if the stashed loaf was mouldy. If not, then there’s another reason not to eat it. On naming future food – we have two ducks. When we got them, we were unsure whether they were girls or boys. The decision was that if they turned out to be boys, we would have them for Christmas dinner, so I couldn’t give them cute “pet” names. Even though they both turned out to be girls (and provide lovely eggs), they are still known as Black Duck and Grey Duck. Very funny post. Don’t listen to the knockers – they don’t know what they’re talking about. They’re called Smilies in the UK, too! Mmmmm Smilies! Also, Julia, amazing post. Love it. Even if I am worried that you can’t eat snakes or sharks but are completely unphased by human babies! I’m kind of surprised that these exist at all- but they were yummy, so I’m not complaining! Haha, poor ducks. I definitely could not eat anything I had seen living. That’s funny that you have Smilies in Australia- I haven’t seen them anywhere except my high school cafeteria. Are those gummy babies still around? Hm, they look kind of like Jelly Babies. And I used to take great pleasure in biting the heads off those little guys. I’m a bad person. Yes, I think you can still get those juicy babies in Oz. I haven’t had them personally, but there is a wide range of Starburst lollies so it’s quite likely. 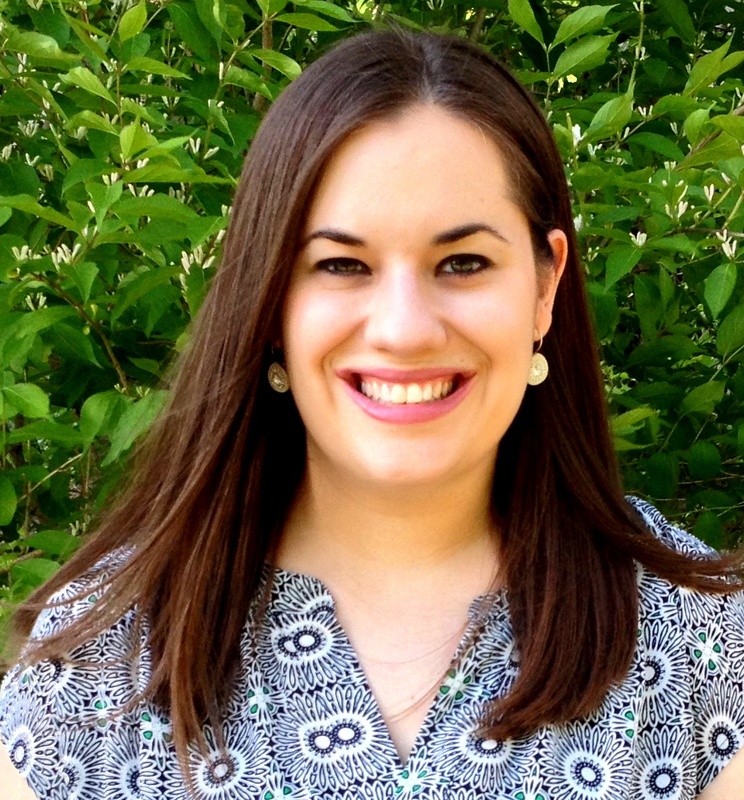 This is the second time you’ve posted a blog on the night of a presidential debate. Do you hide in a closet while Doug is watching CNN? Exactly. I just now posted another entry on this third debate night. Here’s what the commenter who wrote that you should have voiced an opinion on, say, “Bush’s trip to Russia, the rising #’s of people applying for food stamps in the US or the election” didn’t get: There’s already 1,000 columnists doing that. You, however, were the only one offering up wisdom on how you found closure by freeing a St. Patrick’s Day-inspired loaf of bread dyed green and shaped like a snake. I’ll take your column over the same old, same old any day of the week. Haha, thanks so much! It was really interesting to see which columns elicited the most hate mail. I remember once a column about gay rights got zero responses, and a column I wrote the same day about laundry became quite a controversy. It’s always nice when columns you put so much thought and effort into elicit absolutely no response, and the throw-away pieces generate a flood of interest. Really makes you wonder about folks sometimes, doesn’t it? “Well, I don’t know, because it was green to begin with.” — Ha! If there is any piece of wisdom I have gained from this life, it’s that if you are going to keep a food item in your closet for a decade- at least make sure its green. So funny- and you write so well!! Good to find an expert who knows what he’s taniklg about!